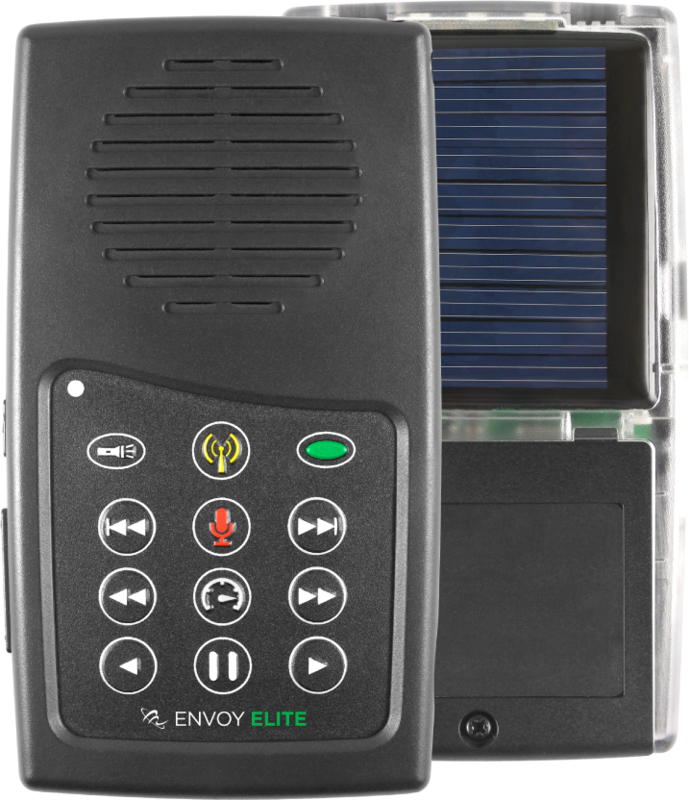 MegaVoice’s most innovative and intuitive solar digital audio player yet – the Envoy Elite. The MegaVoice Envoy Elite represents a totally new category of audio device – the world’s first combination solar-powered player/recorder with FM radio. Users can bookmark up to five favorite radio stations. The Elite comes with 8GB of onboard tamper proof memory. Memory is easily expanded simply by inserting a microSDTM card in the side of the player. For example, add a 64GB card and memory expands to 72GB. Swapping out microSDTM cards gives users virtually unlimited hours of listening enjoyment. The same robust, hard-shell technology used in previous generations of MegaVoice players is also standard for the Elite. It comes with intuitive navigational keypad with raised buttons, stereo audio jack, Micro USB port for charging and built-in LED flashlight with three levels of illumination. The flashlight can be used for up to 8 hours without recharging the player. The Elite can also indicate battery level by briefly pressing the power button while the player is on. The LED light will blink green, yellow or red depending on the battery charge remaining. Not only does the Elite play back hundreds of hours of tamper proof content from the onboard memory, at the press of a button it can also record audio onto an inserted microSDTM card – or the onboard memory if the microSDTM card is not present. Audio on a microSDTM card is easily transferred to a computer where it can be edited, processed and copied for sharing with others. Another new feature found on the Elite is variable speed playback – another first for MegaVoice! Variable speed capability is appreciated by blind and visually impaired people who prefer listening to audio at a slightly higher speed. Setting a slower speed is helpful for those learning a new language or listening to something not in their heart language.